I’ll admit that I had some reservations about the “Avenging Spider-Man” series when Marvel first announced it, and even after the first three issues, which revolved around a Spidey/Red Hulk team-up. It’s not that I objected to the Marvel Team-Up-style formula the series was seemingly going to employ, as that was one of my favorite comic books back in its hey-day. But the cynical side of me noted that with both Avengers and Spider-Man starring in major motion pictures this summer, a fluffy, no-substance comic book revolving around these characters was an easy cash-grab for Marvel. And after the first three issues, some of my suspicions were confirmed – I appreciated the artwork, and the sense of humor throughout, but the series still felt like filler. Fortunately my skepticism has been proven completely unwarranted after the past two issues of Avenging. Seemingly on the dime, the series has been transformed from the marshmallow Peeps of the comic book world to incredible character-driven storytelling that caters to both Spider-Man and Avengers fans. Writer Zeb Wells absolutely hits issue #5 out of the park with his Captain America/Spider-Man dynamic, producing a story that is both funny and poignant. It worked for me on so many different levels. 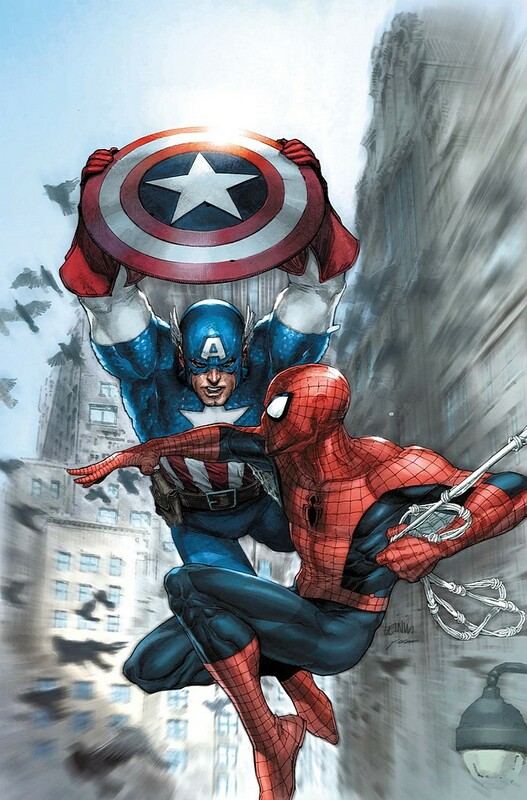 Just some background, as a young child, my first love in the world of comic books was Spider-Man, but following right behind him was Captain America. 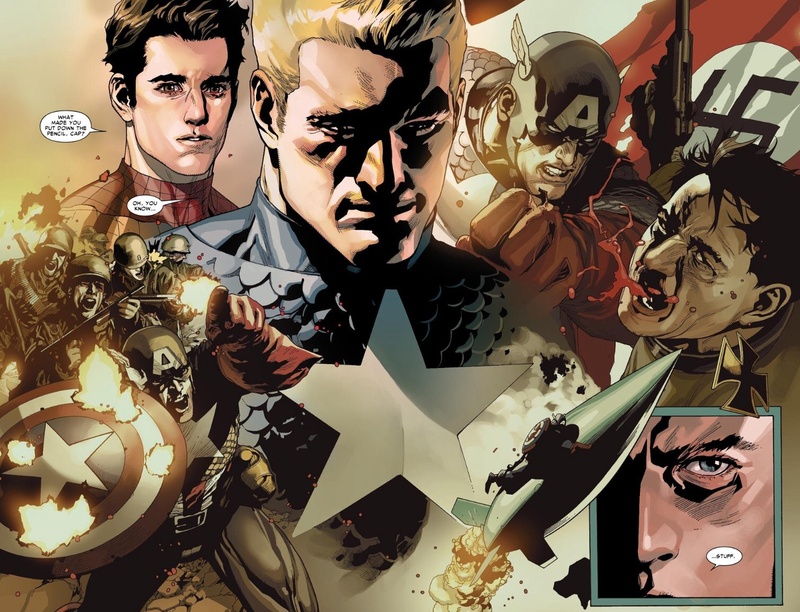 As I’ve discussed in a previous post, Cap was more of “my father’s generation” of superhero – technically more my grandfather’s generation if you go back to his WWII roots. While I’ve evolved intellectually and politically the past 20 years or so since I first started reading Captain America comic books, I’ve always held the character in high regard, much in the way that my father will always be a hero of mine despite the fact that we routinely disagree on just about everything that matters in this world. 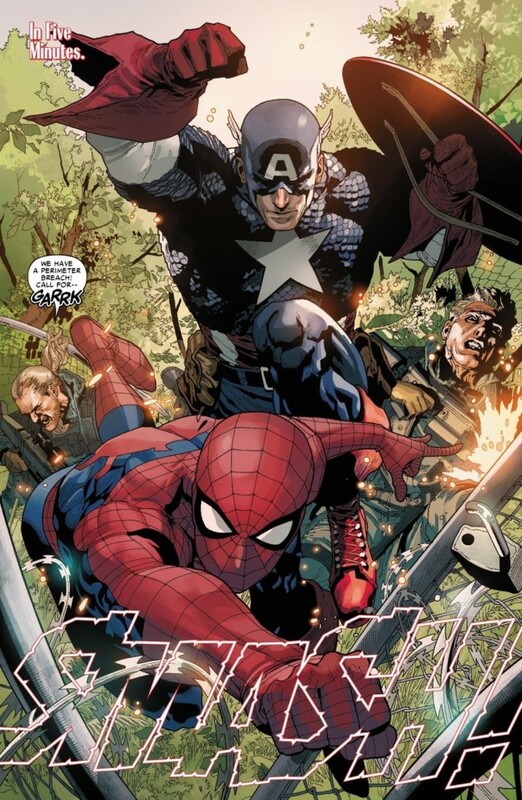 So speaking from a strictly personal point of view, when I picked up a copy of Avenging #5 at my local comic book shop and saw from the cover that it was going to be a Spider-Man/Captain America team-up, I wanted to feel the emotional tug-of-war I experience every time I think about Cap. He’s a larger than life hero, perhaps the greatest hero in the Marvel universe, yet the fatherly (and elderly) way he carries himself about, makes him ripe for conflict from the eyes of the younger generation. The generation gap that exists between fathers and sons is always wide and at random points in our-life, un-crossable. I wanted to see if Wells had the guts to explore that idea, or if he would just recycle the more trite idea that the younger Spider-Man is an asset to the Avengers and Captain America, but a pain-in-the-neck all the same (see how Spidey is characterized in nearly every Brian Michael Bendis storyline in Avengers). Wells took the riskier path with his story and really delivered. That’s not to say Avenging was a serious sappy tale of generational dysfunction. Quite the opposite. It was hilarious from the first page, which demonstrated the ongoing feud between Spider-Man and the arrogant Hawkeye. But there was something so believably innocent about Spider-Man/Peter Parker being captivated by the fact that Captain America was a cartoonist in the years before he became the freedom fighting super soldier we all know and love today. And in true-to-form fashion, Cap initially distances himself from his more childish past. In a true literary moment, he admonishes Spider-Man for living in the past, “do you still pull out your first chemistry set?” Spider-Man initially denies that he does, before realizing that he needs to be true to his own identity – of course he still pulls out that chemistry set. Given that Avenging is a Spider-Man title, and not an Avengers or Captain America story, of course Spidey’s way of thinking prevails, and Captain America succumbs to his long-lost adolescence. And I love that decision because it caters exactly to Spider-Man’s core audience. Spider-Man is the original “boy wonder,” a superhero that encapsulated a disenfranchised, younger generation of comic book readers when he first debuted 50 years ago. While Marvel was turning the comic book industry on its ear in the 1960s with outside-the-box characters like Hulk, the X-Men and Iron Man, it was the teenaged Spider-Man who emerged as their flagship, most marketable/profitable character. In terms of pop culture significance, Spidey is only right behind Superman and Batman as the most recognizable comic book character in the history of the medium. Embracing his innocence and way-of-life is the more intelligent choice on behalf of Marvel, and is such a refreshing change-of-pace from the darker, grittier storytelling that seems to dominate the genre these days. With Wells writing Avenging and Dan Slott continuing his stellar work on Amazing Spider-Man, Marvel seems to have finally hit a long-needed groove with their flagship character. If there was a way to keep both of these guys working on these two titles for the next 5 years or so, I would be beyond ecstatic. I want to see Marvel maintain this status quo with Spidey – I’m incredibly anxious to see exactly what they have in store with Bendis’ “Spider-Men” miniseries that’s going to debut in June.